If national title favorite Duke goes on to cut down the nets in Minneapolis two weeks from Monday, the Blue Devils’ serendipitous second-round escape against UCF will forever be entrenched in college basketball lore. Zion Williamson’s game-saving driving layup, RJ Barrett’s go-ahead put-back and Aubrey Dawkins’ excruciating missed tip-in all would appear in NCAA tournament montages for decades to come. Duke would also not be the only national champion saved by a lucky bounce or a fortunate break. The path to a college basketball national championship often features a close call at a key juncture. Here’s a look at the 10 closest calls eventual national champions endured since the NCAA tournament bracket expanded to 64 teams in 1985. We only considered games prior to the Final Four. Also excluded were near-misses in which the eventual champion was a clear underdog entering the game. That’s why you won’t see Arizona’s 1997 Sweet 16 upset of top-seeded Kansas on this list or Kentucky’s epic 1998 regional final victory against top-seeded Duke. On one side was reigning champ Duke, a favorite to repeat thanks to the return of standouts Bobby Hurley, Christian Laettner and Grant Hill. On the other side was Kentucky, an underdog despite the presence of star sophomore Jamal Mashburn and four in-state seniors who had remained loyal to the program during its two-year probation. Those two legendary teams produced an overtime classic in the 1992 East Regional Final that remains college basketball’s greatest game. After Sean Woods hit a running one-hander to put Kentucky ahead 103–102 with 2.1 seconds remaining, Laettner answered with “The Shot,” a turnaround jumper at the foul line to win the game for Duke. The Blue Devils went on to edge Indiana in the Final Four before throttling Michigan’s Fab Five to claim back-to-back national titles. The signature moment of UCLA’s only post-John Wooden national championship run came in the second round of the 1995 NCAA tournament. It was then that the top-seeded Bruins turned to their point guard and asked him to save their season. There were 4.8 seconds left and UCLA trailed by a point when Jim Harrick instructed Tyus Edney to go the length of the floor and look for his own shot. The 5-foot-10 senior sped down court, used a behind-the-back dribble to get his man on his hip and then scored a right-handed layup at the buzzer over the outstretched arms of a help defender who had stepped into his path. That was the last time UCLA was seriously challenged. The Bruins defeated reigning champ Arkansas in the national title game behind 30 points from Ed O’Bannon. Two games before Keith Smart’s iconic jumper to beat Syracuse in the 1987 national title game, Indiana withstood another close call. Bob Knight’s top-seeded Hoosiers trailed Dale Brown’s 10th-seeded LSU Tigers by as many as nine points in the final five minutes before storming back with an 11-1 game-ending surge. Rick Calloway scored a put-back with six seconds remaining to give Indiana a 77-76 lead, the Hoosiers’ first since it was 47-46. Brown called timeout in hopes of drawing up a last-second miracle, but center Nikita Wilson’s turnaround jumper from the foul line clanked off the rim. Kansas won Bill Self’s lone national title despite doing the one thing no basketball team should ever do. The Jayhawks gave Stephen Curry a chance to beat them on the final possession. It was the 2008 Elite Eight, and top-seeded Kansas was a heavy favorite against a 10th-seeded Davidson team that had previously upset Gonzaga, Georgetown and Wisconsin. The Jayhawks had led by as many as six points down the stretch, but now Davidson had one final possession down two with 21 seconds to go after a Sherron Collins’ 3-point miss. Kansas trapped Curry as he came off a ball screen, forcing him to pass to point guard Jason Richards. His desperate 3-point shot caromed hard off the glass and Kansas survived, setting up the only Final Four in NCAA tournament history with only No. 1 seeds. UNLV’s 1990 national championship team is hailed as a juggernaut because of its demolition of Duke in the title game, but it’s easy to forget how close the Rebels came to not advancing out of the Sweet 16 that year. Twelfth-seeded Ball State was one shot away from ending their run two victories shy of the Final Four. An 11-point second-half UNLV lead was down to two when Greg Anthony missed the front end of a 1-and-1 with 12.6 seconds to go. The Rebels held on for a 69-67 victory only after center David Butler intercepted a weak lob pass in the middle of the lane in the final seconds, preventing the Cardinals from getting off a shot. You probably remember 1985 Villanova as one of the most surprising national champions, the eighth-seeded underdog that toppled Patrick Ewing and Georgetown in an epic national title game. What you may forget, however, is that the Wildcats very nearly didn’t escape the first round of the NCAA tournament that year. Facing ninth-seeded Dayton on its own home floor proved to be a major challenge for Villanova. The Flyers actually led 49-47 in the final minutes until Ed Pinckney scored a game-tying layup and Harold Jensen added a go-ahead one. Dayton still had one final chance to win the game or force overtime, but Sedric Toney’s put-back with three seconds left rimmed out. There was little reason to believe this game would be relevant to the national title race when UConn and Saint Joe’s tipped off. The seventh-seeded Huskies had lost eight regular season games that year and finished third in the fledgling American Athletic Conference. The 10th-seeded Hawks might not have made the NCAA tournament at all had they not won the Atlantic 10 tournament. Amida Brimah forced overtime by completing a game-tying three-point play in the final minute, Shabazz Napier scored nine of his 24 points in overtime and UConn emerged with an 89-81 victory. Then the Huskies caught fire out of nowhere, reeling off wins over Villanova, Iowa State, Michigan State, Florida and Kentucky to claim their program’s fourth — and most improbable — national championship. Before Kansas could blossom into Danny and the Miracles, the sixth-seeded Jayhawks endured an unexpected second-round challenge from unheralded 14th-seeded Murray State. 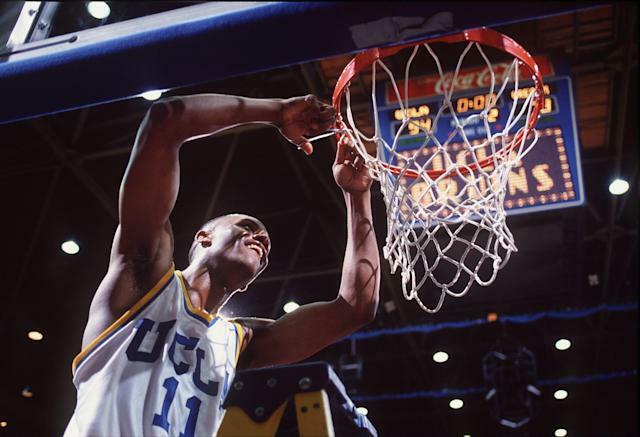 The Racers had a chance to win the game on their final possession even after Danny Manning put Kansas ahead by one with a low-post basket in the final minute. Murray State entrusted point guard Don Mann with the chance to win the game, but the 5-foot-8 junior found little daylight against a Kansas defense geared to stop him. His off-balance runner in the lane caromed hard off the backboard, enabling the Jayhawks to corral the rebound, sink two last-second free throws and escape with a 61-58 victory. Kemba Walker’s Huskies won 11 straight games in less than a month to hoist the 2011 national championship. But on March 26, the fate of the astounding run lay in the hands of Arizona senior Jamelle Horne. Kemba’s magic had dried up in the final minute of a 65-63 game. With eight seconds left, Zona’s Derrick Williams clanged a potential go-ahead three off the back iron. But the Wildcats scrambled for the rebound. The ball found its way to Horne, a 40 percent 3-point shooter, in the right corner. His rainbow was right on line, and looked true, but bounced off the rim and out. UConn survived and advanced to Houston. Luke Maye scored one point in the 2016 NCAA tournament. At the following year’s Final Four, which would end with an upperclassmen-led Carolina team cutting nylon, he scored two. But without Maye, the Tar Heels might not have been there. In an Elite Eight showdown with Kentucky, Malik Monk had shot down a seven-point UNC lead in the final 50 seconds. With a 3-pointer Jim Nantz described as “impossible,” he’d tied the game at 73. But Roy Williams eschewed the timeout in his pocket, Theo Pinson sped up the floor, and pitched to Maye on the left wing. The sophomore, who’d initially committed to UNC sans the promise of a scholarship, drilled a 20-footer – his 16th and 17th points of the game, a career high – to send Carolina to Phoenix. UCLA guard Tyus Edney cuts down the net in celebration of the Bruins' Pac-10 championship after a victory over Oregon State at Pauley Pavilion in Los Angeles. Yahoo Sports writer Henry Bushnell contributed to this story.